Modern businesses spend a lot of time going to meetings. In fact, your conference room might be one of the only places where your entire team gathers, and your most important business is often handled there. This can include brainstorming sessions, customer meetings, and talking to your investors. This makes your conference room one of the most important areas in the building. 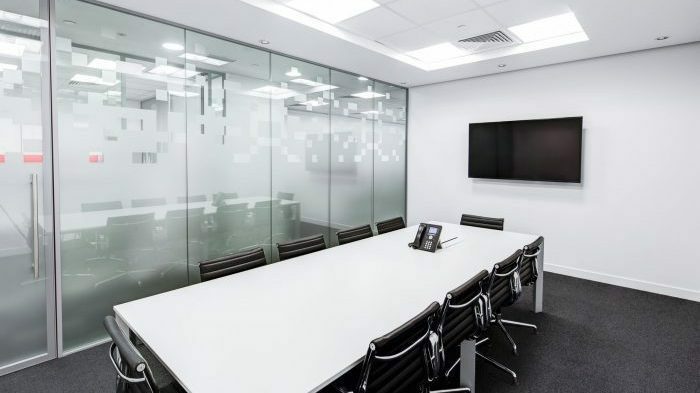 If you’ve been considering a meeting room upgrade, then there’s a lot to factor in before you get started. 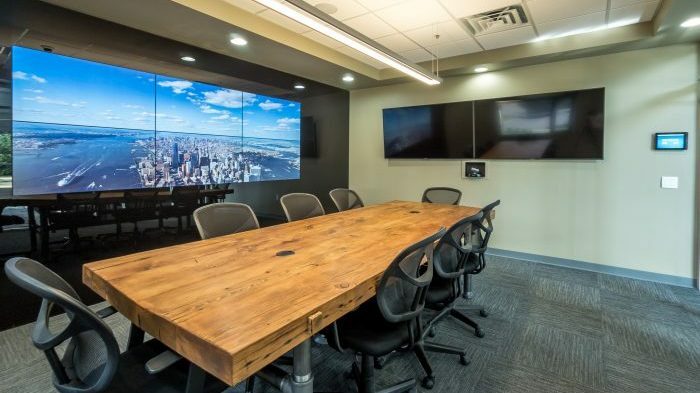 Upgrading a meeting area is often an expensive undertaking that could include extensive infrastructure and tech changes, and without proper planning, you could end up wasting a lot of money. Determine what kind of meeting space you need. The first step is to establish what your needs are for this space. What type of meeting room are you designing? The requirements for a board room will be different from those of a one-on-one meeting area for talking to employees. Is this a formal meeting room for clients or investors, or is it a more casual brainstorming place for your employees to generate new ideas? A more fun atmosphere might work for the latter, but the former needs to maintain an air of professionalism. Take size restrictions into account. Your most significant limitation when designing your conference room will, of course, be the size of the space. 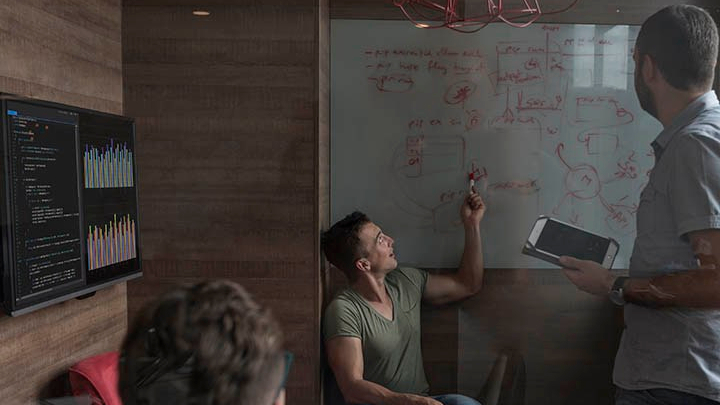 If you have a small office and putting the meeting room elsewhere is not an option, then you’ll need to work within these limitations. A smaller space isn’t necessarily a bad thing; in fact, these areas can be more intimate and welcoming than larger spaces, often making people feel more comfortable. On the flip side, cluttering an already tiny space with loads of furniture is a sure way to make everyone feel claustrophobic. If you’d like your small meeting room to appear bigger though, focus on these tips. What furniture would complement the space? Again, you’ll need to take into account the type of space that you want to create. 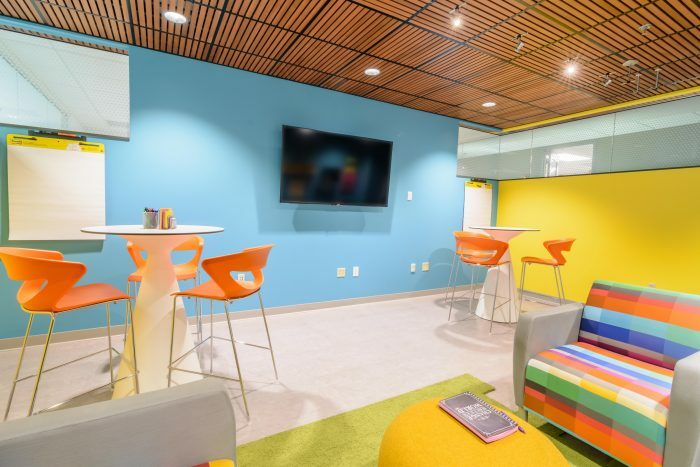 If you’re looking to make a meeting area for brainstorming that you want to be relaxing and fun, then bright colors and comfy lounge-style furniture might be the way to go. Bright colors like yellow can make people feel optimistic, and it can help to up your productivity levels. However, for a boardroom or client meeting area, you might need a different approach. More muted colors like white or blue can make people feel calm, and aid in concentration. ● Is this a formal or casual meeting area? ● How many people will need to use the meeting room? ● What manner of business will you conduct there? ● What other equipment needs to fit in the room? ● How large of a space do you have to work with? 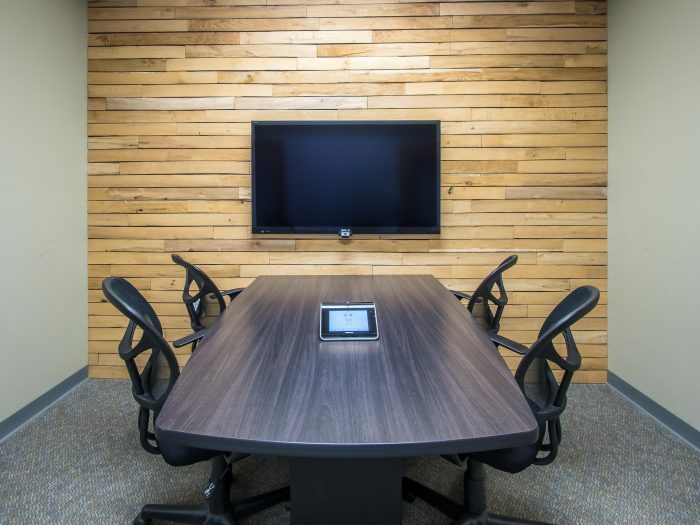 When choosing the furniture for your office meeting space, it’s important to know who you’re building the room for and to take your office’s culture into account. While fun designs and bright colors might be appropriate for a tech startup, it might be less appropriate for a law office or a financial company where you’re expected to represent your business a certain way. 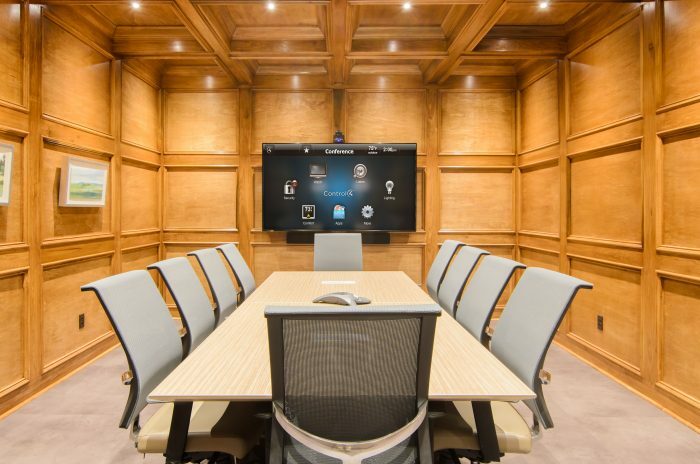 What kind of infrastructure does your meeting room need? 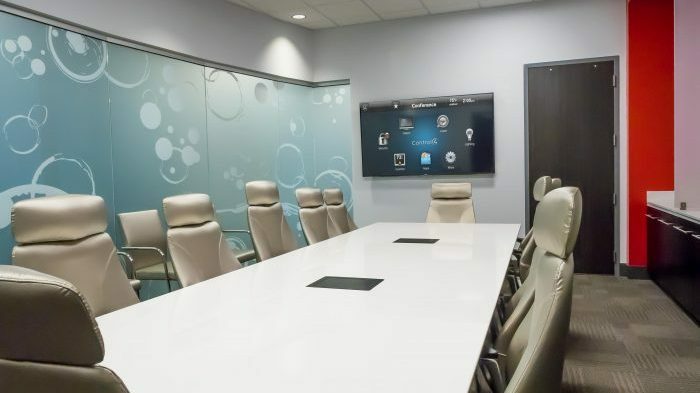 Your conference room will likely require the use of projectors, computers and other connected equipment for presentations. For this reason, it’s important to consider what type of cabling infrastructure you’ll need and the in-floor electrical requirements of the space. 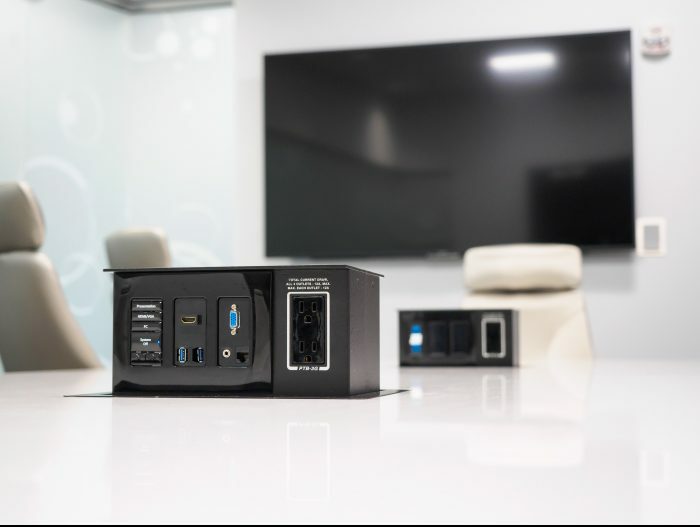 Having various cables running all across the floor and having people competing for electrical outlets is not only infuriating, but it also doesn’t present a professional appearance when partners or investors come in for meetings. Your best bet here is to go with wireless technologies where you can, and in-ground systems when you can’t. Good wireless technology will work for decluttering network connection cables in most cases. Using raceways to hide cables running on the ground is an excellent way to manage your cable clutter. These can then lead up to the conference table, and then out through recess portals where presenters can plug in their laptops or tablets. Your infrastructure, or rather lack of visible infrastructure, can also assist in impressing those that enter the space. All of these considerations I’ve listed above go hand in hand with creating a certain feel to your meeting or conference room. By having a clear vision of the space before you get started, you’ll be able to set the tone for the room in both style and tech capabilities. As a result, you should have a smooth upgrade with no surprises.